Writing film scripts has commonly been seen as a lonely ordeal for the writer, especially as compared to the close teamwork of shooting a film. Moreover, once the script is completed and handed over, it tends to lose its integrity in the process that often results in the director being considered as the film’s author instead. While Hollywood has given us countless stories of frustrated and disillusioned scriptwriters, a look into the Golden Age of Japanese cinema in the 1950s offers an altogether different and brighter picture. That was the time when scriptwriters were able to take advantage of excellent working facilities within the flourishing studio system. Bigger companies often sent their writers to regular inns (jōyado) in laidback travel resorts where they could work on their scripts at a leisurely pace over a lengthy period of time while interacting with other lodging writers. At the same time, writers had the final word over their work and received credit that they rightly deserved. In effect, the writers’ contributions to cinema were at the time garnered considerable critical acclaim and popular fascination. This talk aims to explore the image of scriptwriters within the lively communal space and look at the industrial and critical status of these almost literary figures. 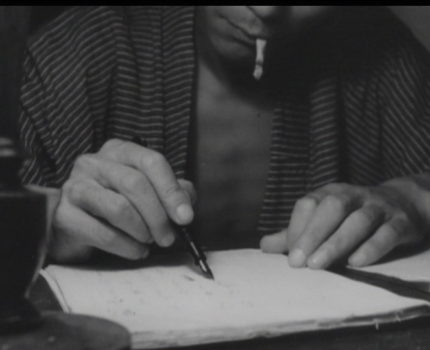 By focusing on the conditions of production, the speaker hopes to provide fresh insight into how ideas for films were actually put on paper during this most illustrious era for Japanese cinema. At stake here are both the issue of film authorship but also that of its reception as the popular appeal of film scripts (shinario) led to them being widely published and read before, during and after watching the film. Dr Lauri Kitsnik (MA Tokyo PhD Cantab) is Robert and Lisa Sainsbury Fellow at the Sainsbury Institute for the Study of Japanese Arts and Cultures in Norwich. As part of the fellowship, he is currently preparing his dissertation for publication. His interests include (but are not limited to) film history and theory, adaptation and screenwriting. His work has appeared in the Journal of Japanese and Korean Cinema, Journal of Screenwriting and Women Screenwriters: An International Guide.